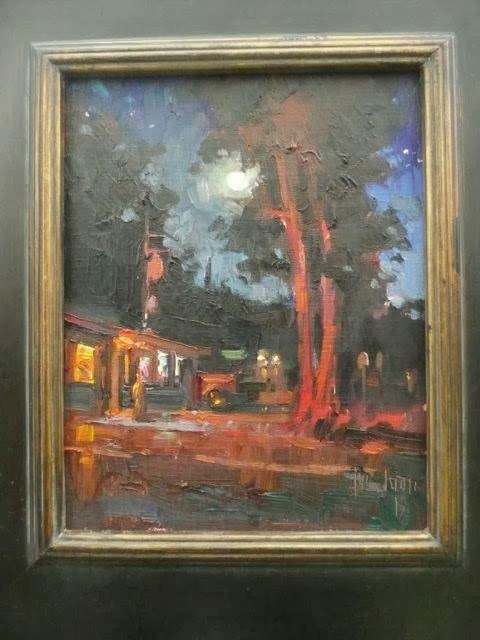 As in all the plein air events, after all is said, painted and done, the statisticians in all of us come up and start wondering, why didn't I sell more, why did others sell more? etc.. Useless exercise if there ever was one but unavoidable. Each one takes their own conclusions home and a few intimate their findings. 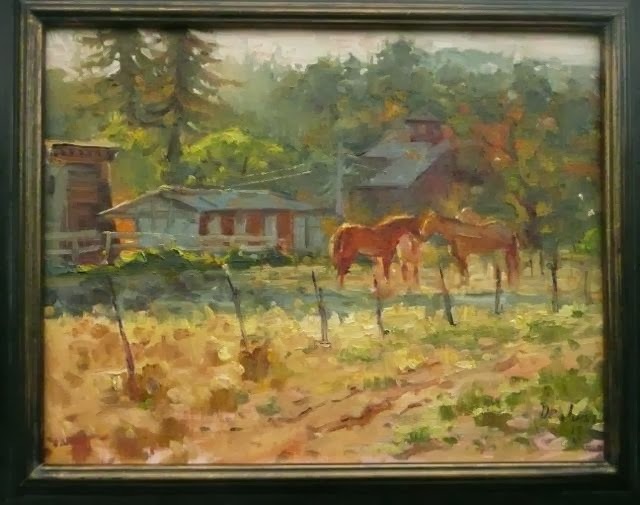 It's always an algorithm with evanescent variables between weather, name recognition, size, subject, local fame, price range, etc... My conclusion: warm muted paintings in the 5x7 to 11x14 range mostly of agricultural subjects by painters with a record (not criminal). Immediately after that, I throw my conclusion to the wind. My intention from the start was to challenge myself to larger pieces and avoid the obvious. Water was a big attraction to me stuck as I am in a waterless place....Oh , I did pander, yes i did, I painted the Sonoma Square, I admit it. And it didn't work as I expected. So there you have it. So don't expect me to say you should paint this or that in this event because it will be as useless to you as it should be. 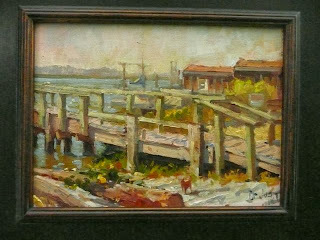 The out o'sight paintings sold and many of the very good ones sold if they were attached to painters with a history. 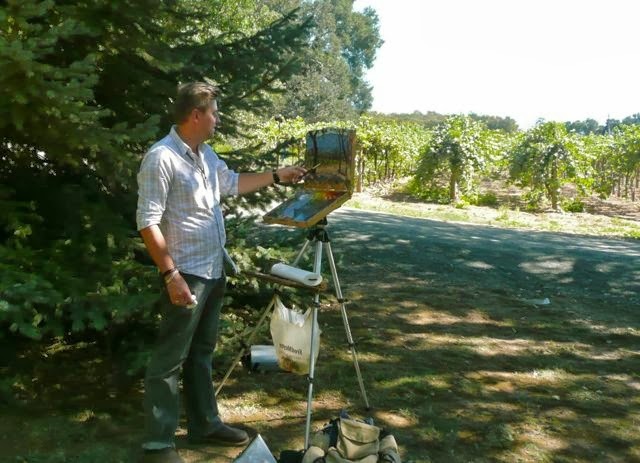 The quality of everyone's work was outstanding and there were many watercolorists which I found refreshing. Moving on, this was my second year doing this event and even though the organizers changed the dates to minimize the chance of rain, it rained, on the day of the sale... oodles. That didn't deter the brave souls actually interested in buying artwork so I think it was success overall but numbers will tell. The organizers did an OUTSTANDING job yet again at providing lodging, booths, lunches and plenty of occasions to mingle. 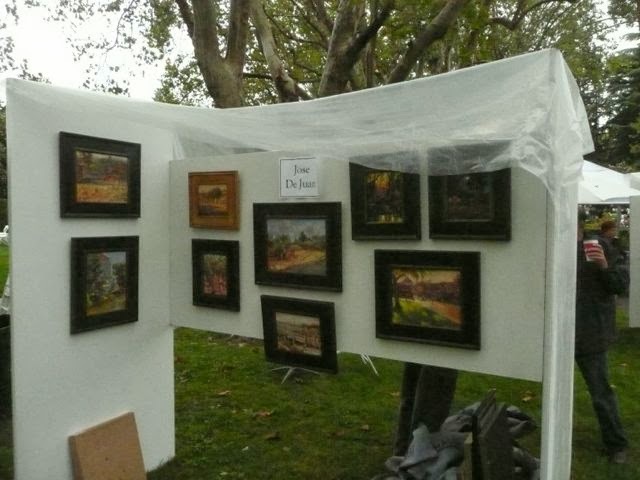 I do think this is one of the best plein air events in that regard. 40% of the profits go to support art school programs in the county so it is a very worthy cause too which pushes artists and collectors to make it work. 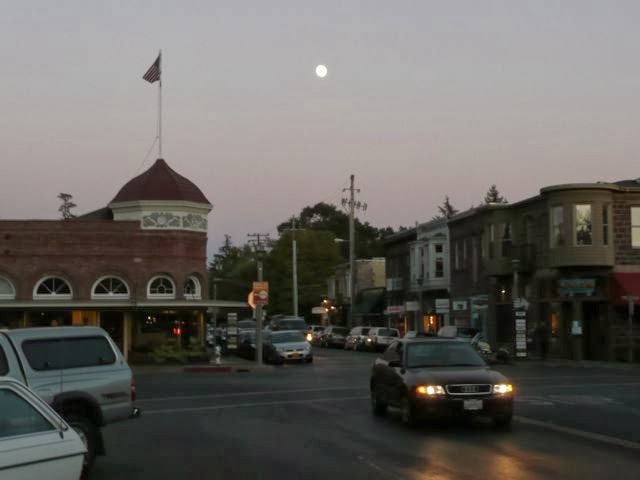 Sonoma is a wealthy county with breathtaking landscapes so it's a perfect conspiracy of sorts. Well, except for the rain on the sale day but I'm sure the farmers were delighted. 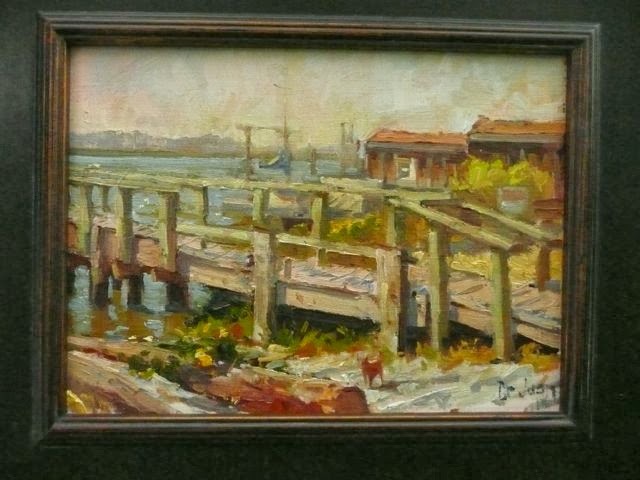 At the gala reception with "Petaluma reeds" 9"x12" sold. Gala dinner and silent bid at the Fairmont Resort. In a brief summary of my brilliant location scouting (not at all) this year I decided to venture to Petaluma - which wasn't too far - in hopes of some river scenes. Petaluma is a bit of a suburb with a charming town but not the sweeping river vistas I was hoping for. It's a convenient painting location and I did a couple of paintings while avoiding the "too quaint" city center. 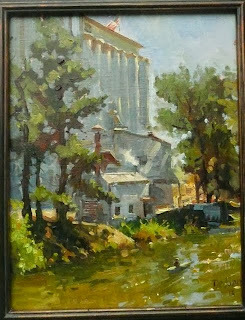 May be I went overboard with the grain elevator piece below. It was the contrast of the huge shadow mass against the wisp of smoke and the water that made me decide on the subject. The fact that I added a guy in a canoe tells me I was concerned about the stark industrial theme even though it is the light/shade pattern that originally motivated me. Petaluma grain elevator. 14"x11' Jacobson collection. One of the luncheons was provided at Quarryhill Botanical gardens. It is commendable that the organizers talk to places like these beforehand into letting us camp there. They make sure the locations are also very scenic. Quarryhill isn't only lovely but it has ponds and a vineyard as well. 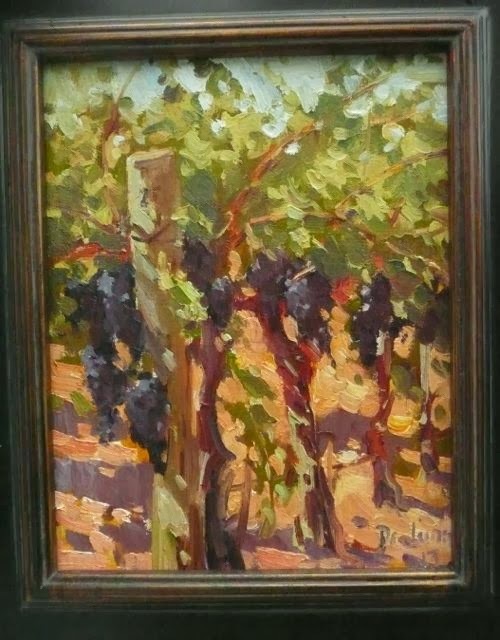 That's where I painted the "Velvet Juice" piece below attracted again by the play of light and the contrast with the velvety grapes. "Velvet juice' 10"x8" Quarryhill Gardens. On a couple of occasion I decided to aim for the coast as Bodega Bay was in everyone's mouth. Aiming as I did, the ditch by the road, barely a mile away from where I was staying , was what I ended up painting. It has water in it, of course. Never mind the dead raccoon stench, the steps going down into the creek were too much to resist in a "create your own metaphor" way.
" 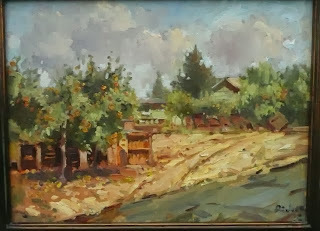 In the ditch" 10"x8"
Ah, but the dead raccoon was nothing compared to the troubles that I endured painting this idyllic apple orchard in Sebastopol. Looks innocent enough doesn't it? It was a day of gorgeous clouds and a premonition of weather coming our way. I arranged for permission to paint and no sooner had I set up my easel, strong, persistent winds started kicking the thin dust and making it swirl all around in little tornadoes that toppled my easel twice, covered my car and kept me sniffling for the remaining two days. 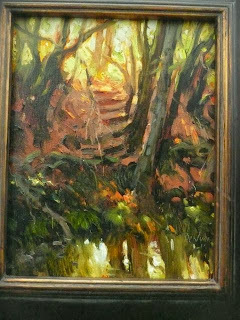 This painting is oil ...and soil, on canvas. I'm sure a few flies also left their lives and opinions on the surface. The trees were covered in apples because it is apparently not profitable to pick them these days and farmers prefer to let them rot instead of incurring a loss. 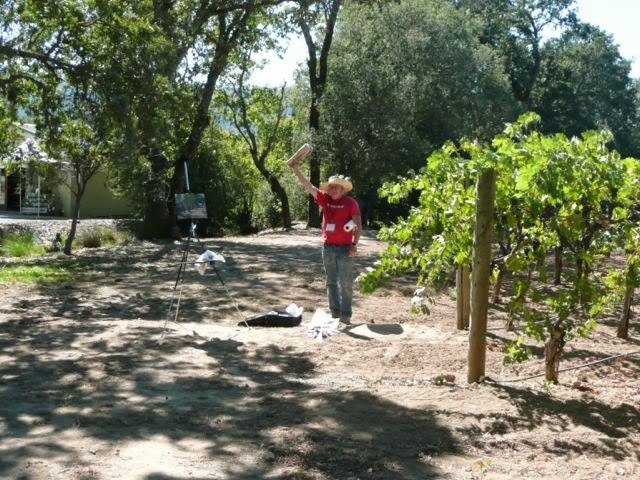 But the Sonoma landscape is like a pillow for the senses. It's the farms that accent the mellow hills that make it into a visual church. I was driving around Petaluma when I came upon the clean geometry of this landscape. This painting falls into the category of artwork I was talking about at the beginning, that sales algorithm . It happens to be one of my favorites and it went to a collector which I hope will enjoy it as much as I did. Right after the golden farm, I started chasing the harvest moon around. It was late and very dark when I settled for a nocturne. 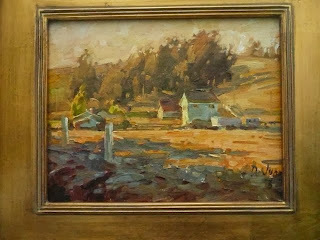 I painted "Stagger back home" also in Petaluma. It represents a liquor store by the side of the road. No light other than a headlamp was used. I was situated across the store in a pitch black junkyard. I kept hearing a shufflle of bushes and smelling intense whiffs of marihuana but never saw anybody. I finished this one fast but it turned out pretty interesting. "Stagger back home, Jack" 10"x8"
This piece below was painted on Lakeville road south of Petaluma. On a rickety old river harbor. It took me a while to render the intricate latticework of the dock. 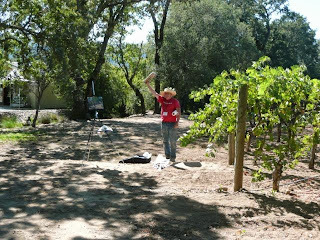 It's a wonderful place to paint and the owner of the place is the chihuahua Rosie which made it to the painting as well. She has plenty of work in this derelict spot without us painters coming around to cause trouble. Twelve paintings total. Some of theme are here. 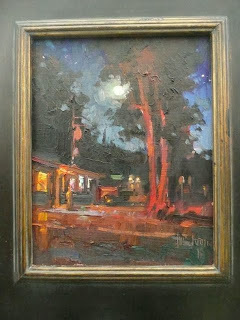 A quick draw piece, And this one also done close to where I stayed in Glen Ellen. Sonoma has become one of my favorite events. The artists and the organization are fantastic and a model to follow. Daniel Aldana and Dan Schulz paint at Quarryhill. Chuck Kovacic, unable to pose without flair. It's a shame to see beautiful paintings out in the rain! I especially love In The Ditch, where you handle the tangle of shrubbery that have no real solid masses. It's informative to see how well you tackled that, and made sense of it.